*Who* is going to FCN? Post here if you are! *When* are you arriving? *What* is your favorite color? 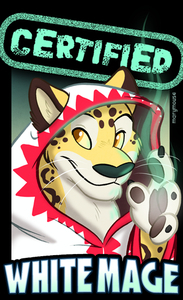 Software Engineer, Anthrocon organizer, DevOps, AWS, Yii, Drupal, node.js, Dorsai Irregular, CAUCE founder, furry fan, Eagle Scout, 28% cheetah. It's hard to put into words just how much your icon makes me smile. Makes me want to dress up like a little black mage. Hey thanks for the watch :) Funny seeing your watch on my page, I haven't told anyone yet that I've set up an account here. Nice to see you, Giza!